Product prices and availability are accurate as of 2019-04-24 12:38:17 EDT and are subject to change. Any price and availability information displayed on http://www.amazon.com/ at the time of purchase will apply to the purchase of this product. If you only keep one flashlight around the house, it should be this one. 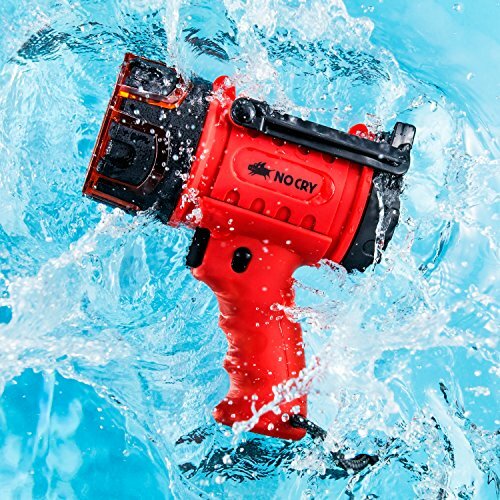 The NoCry Rechargeable Flashlight / Spotlight is extremely versatile with its powerful 1,000 lumen LED bulb with 3 brightness settings: High (1,000 lumens), Medium (500 lumens) and Low (100 lumens). That allows for an impressive illumination range of anywhere between 90 to 300 yards - you choose exactly how much light you need at the time. Beefy Lithium-Ion battery outlasts most other spotlights. The rechargeable battery lasts between 6 and 20 hours, depending on which brightness setting is selected. You can actually leave it plugged in to ensure that maximum charge is available exactly when you need it. Won't lose power when not in use. 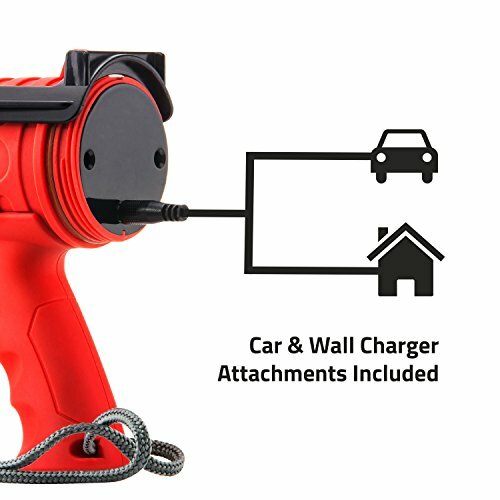 Includes both wall and car charger attachments. Pro tip: Always plug the flashlight in after use to ensure full charge when you use it next. Built to last. Won't break if you drop it. Won't sink in water. Made of surprisingly soft-feeling impact-resistant matt plastic, the sturdy case protects the LED light and Lithium-Ion battery from damage caused by bumps or drops during normal use. And, if you drop it in water, don't worry - it's waterproof up to 3 feet deep, and floats up to the water surface. Plus, its lightweight and compact size makes it easy to take with you wherever you go. Lots of extra features you'll love (that other lights don't have). 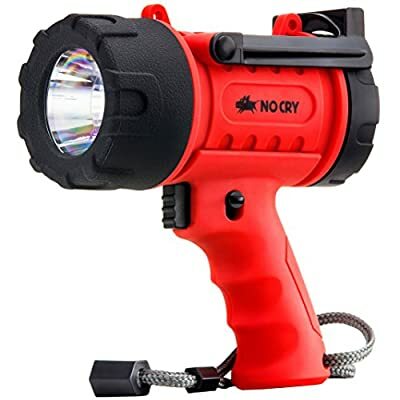 As you've come to expect with NoCry products, this flashlight / spotlight is designed with several "extras" that make using it a breeze. 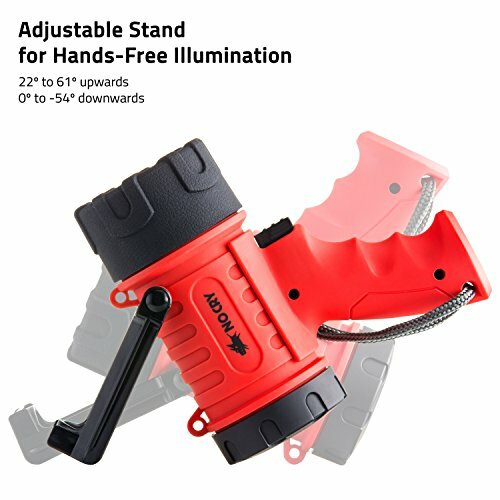 Like an adjustable stand that secures the light beam shining upward at any angle between 22º and 61º, or downward 0º to -54º for when you need your hands free. Or a detachable red-light filter for undisturbed night vision, a handy cord loop for easier storage, and an easy-to-use switch lock to ensure you don't accidentally turn the spotlight on or off. If you feel ready, order your NoCry Spotlight now. A POWERFUL LIGHT WHEN YOU NEED IT THE MOST. Super-bright 18 Watt LED light with three brightness settings: High (1,000 lumens), Medium (500 lumens) and Low (100 lumens). At 1,000 lumens, it's significantly brighter than many higher-priced spotlights and flashlights. Removable filter enables both white and red light settings. FINALLY A RECHARGEABLE SPOTLIGHT WITH SERIOUS LASTING POWER - UP TO 20 HOURS. Stop searching for batteries that are never there when you need them. This spotlight is made with a long-lasting, rechargeable 7.4 volt 18,500 Lithium-Ion battery with serious storage power (3000 mAh). 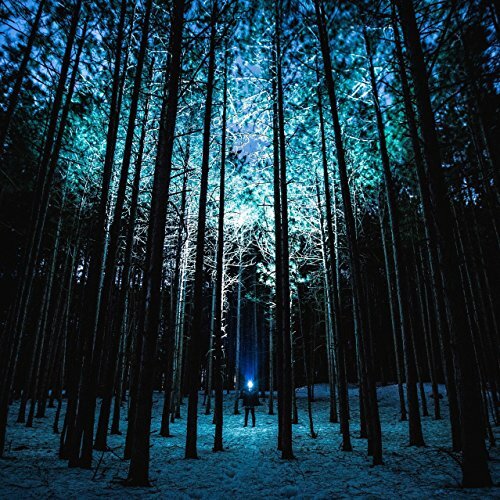 A full charge is made to last longer than virtually any other flashlight - from 6 hours at 1,000 lumens to a whopping 20 hours at 100 lumens. IMPACT RESISTANT, WATERPROOF, AND DOESN'T SINK. Made from tough, impact resistant ABS and polystyrene to protect the system from drops and bumps while in use. Should you accidentally drop it in water while hiking, camping, sailing or hunting, no worries - it's waterproof up to 3ft deep, and floats to the surface of the water so it's easy to retrieve. SO LIGHTWEIGHT AND COMPACT YOU CAN TAKE IT ANYWHERE. This handheld flashlight weighs less than a pound (15.1 oz) and measures just 6in long and 3in wide, so it's easy to carry and hold while walking or hiking outdoors. It might be a powerhouse in your hand, but you won't get tired of holding it. Includes an adjustable stand for hands-free use. YOU'LL LOVE IT OR WILL GET YOUR MONEY BACK. Your NoCry Rechargeable Spotlight comes with our no hassle guarantee. If you experience an issue, we'll replace it or give your money back. Quick, simple, easy.